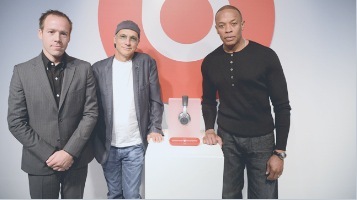 The Beats by Dre brand has helped to make Dr.Dre one of the highest paid in the music industry, raking him in a pretty $45 million in 2011. Those slick, jewel coloured headphones have attained prime product placement in just about every major label music video and advertisement produced since 2010. Just about accessible in price, starting in the low end of Â£120, these headphones are highly visible in street and their expense hasnâ? ?t stopped the masses buying in. Now Beats Electronics have bought music streaming service MOG and have enlisted the help of alternative music legend Trent Reznor to create a successful new streaming and merchandising experience as Creative Chief. Reznor has been around to see both the heady days of huge record company pay-outs in the 90s and the eventual crash of the CD-buying industry. The former Nine Inch Nails front man knows a thing or two about how to engage music fans in todayâ? ?s music landscape. Reznor has been using Topspin to sell his merchandise inside of the music streaming on his website. Reznor remarked that Spotify has given consumers volume, without giving them ease of discovery, and that Project Daisy will fill this gap in the market by giving people â? ?intelligent curationâ??. The CEO of the project, Jimmy Iovine (of Interscope-Geffen records) and marketer behind the careers of icons like Eminem and Lady Gaga, told one news outlet that he allegedly pitched the music subscription service idea to Steve Jobs back in 2003. Fast forward to 2012, Apple are just now rumoured to be planning their own new iRadio service, which will touch on some of the same concepts. The two companies already have a retail relationship: Apple stores currently use the Beats by Dre headphone series to showcase their iPods and sell mobile phone units. Interestingly, Iovine claimed that the tech companiesâ?? lack of understanding of music culture means that any tech-based company will always fail at selling a music subscription service to music fans. Iovine, who recently served as a coach on American idol (where he â??comicallyâ?? repeatedly referred to colleague Jennifer Lopez as â??Jessicaâ?? ), has promised that the new subscription service will come with a â??guideâ?? function authored by credible cultural voices. Iovine definitely has an incomparable track record of launching credible artists, and with consultants like music legends Trent Reznor and Dr Dre at his back Project Daisy might be the game changer that he feels it should be. Yet free mixtape sites like DatPif and YouTubeâ? ?s streaming service now control a substantial aspect of how people discover and access new music, with suggestion and peer recommendation built in easily and cheaply into both services. Weâ? ?ll be following Project Daisy as it unfolds.